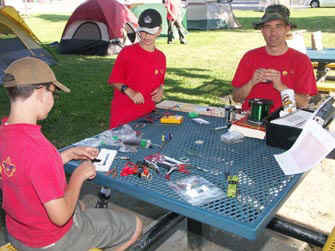 The GOTA station this year was organized by Brett W6BAC, who is the scout master of BSA Troop 788. Learning how to log is scout Evan Sepmeyer on the right. 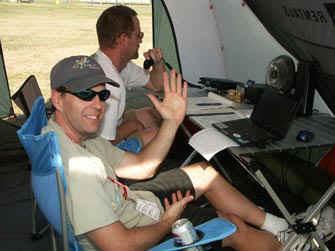 Later in the evening, a scout, ??? 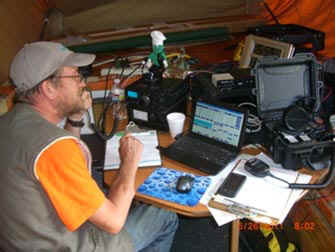 ?, tunes the GOTA station on 75M looking for another FD contact. 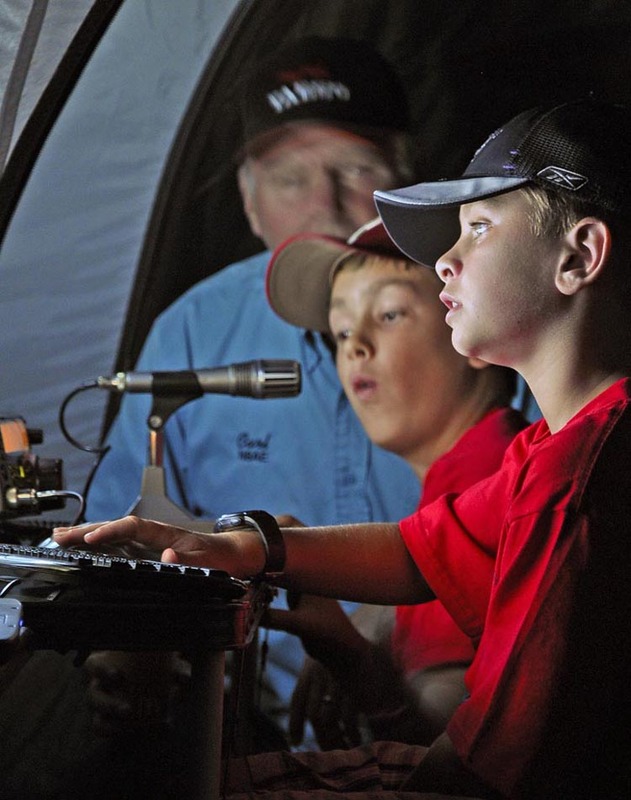 Take some wire, add some batteries, learn to use a voltmeter and the Boy Scouts have all the ingredients to learn electronics during their Field Day outing. 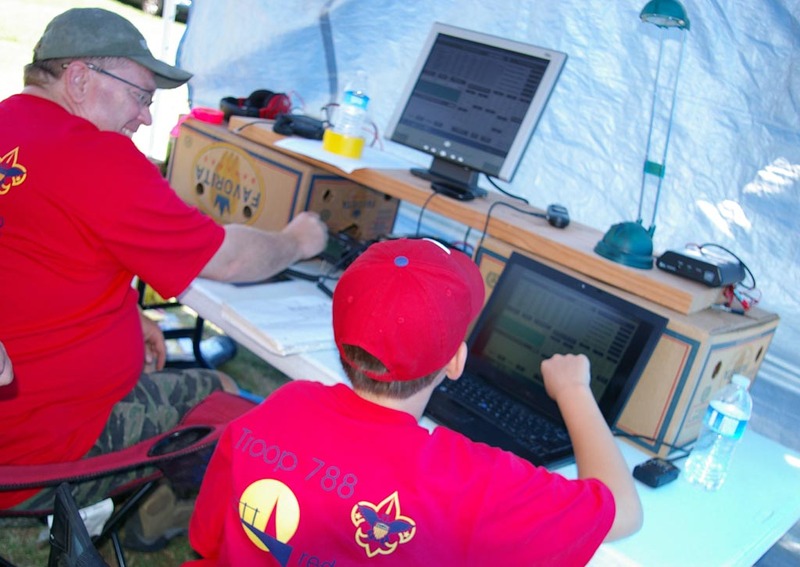 Band-captain Robbie KB6CJZ walks towards the 144/440 MHz station tent. 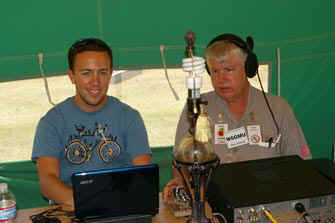 In the 144/440 MHz tent, Nick KD8IPE takes a turn at the mike while band-captain Robbie KB6CJZ does the logging. 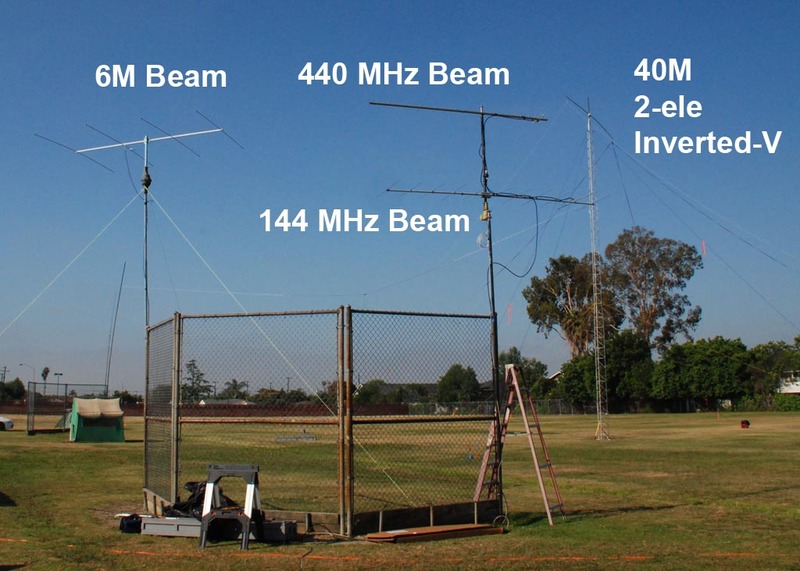 Here is a photo of the 50/144/440 MHz antenna farm, with the masts clamped to a convenient baseball "back-stop". The 40M tower can be seen off to the right. Jay KI6WZU's trailer housed the station for the 6M operations. Jay KI6WZU had a blast operating 6M this year at FD. 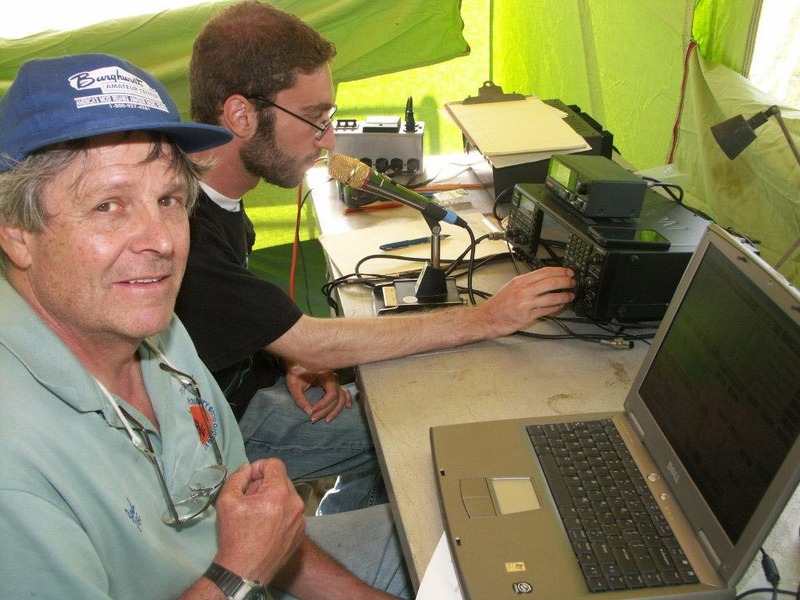 A "sporadic E" opening allowed him to contact Southern NJ as well as quite a few mid-West stations. 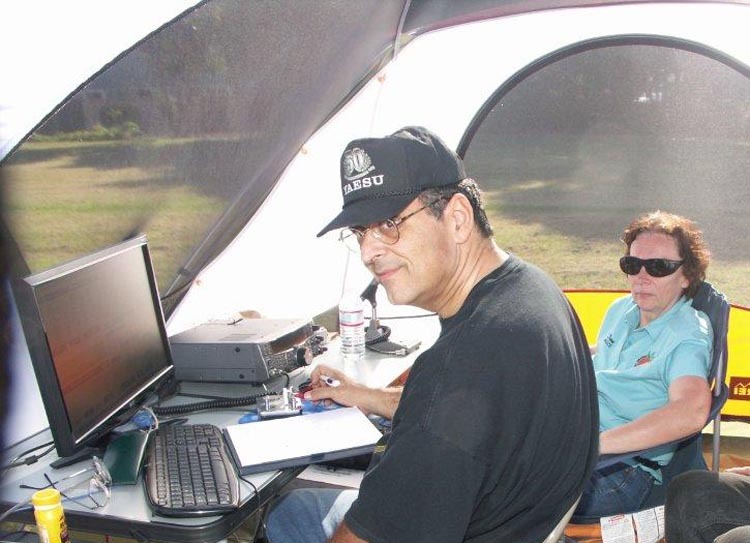 Co-band-captains Dee N8UZE and Carl N8AE operated 10M PHN, 10M CW, 75M PHN and 80M CW. Ken WB9YCJ takes a turn at operating 10M CW with Dee N8UZE watching in the background. Two young scouts venture from the GOTA station to seek adventures in the 75M phone tent. 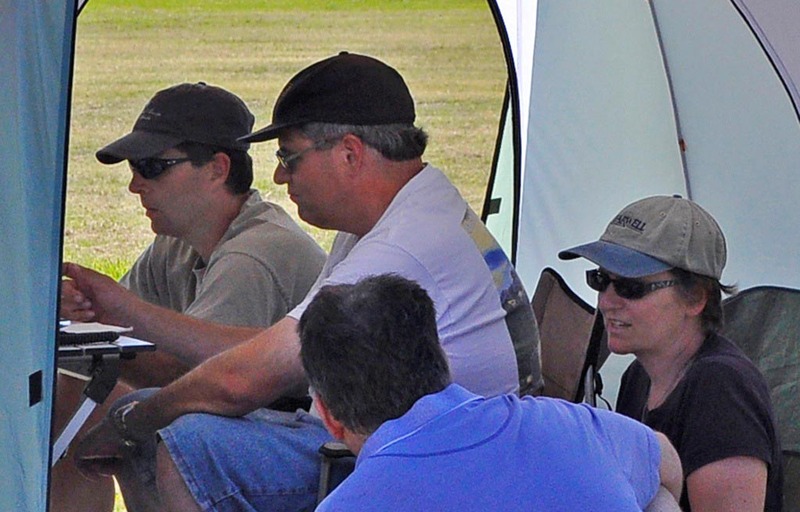 Carl N8AE (in the background) provides coaching and encouragement for these future hams. This photo shows the tent for the 15M CW and PHN station. 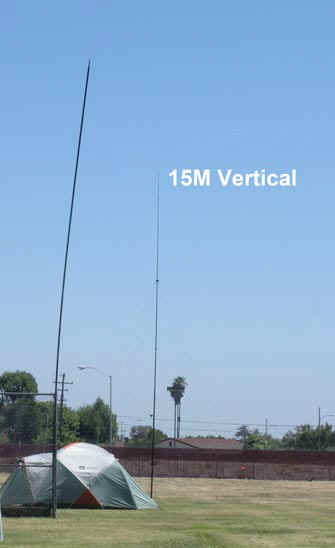 The vertical in the center is the antenna for 15M. 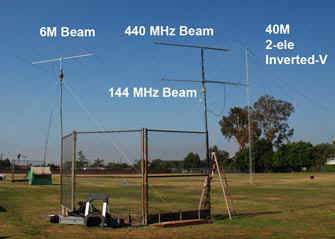 The mast to the left supports one end of the 20M CW antenna. 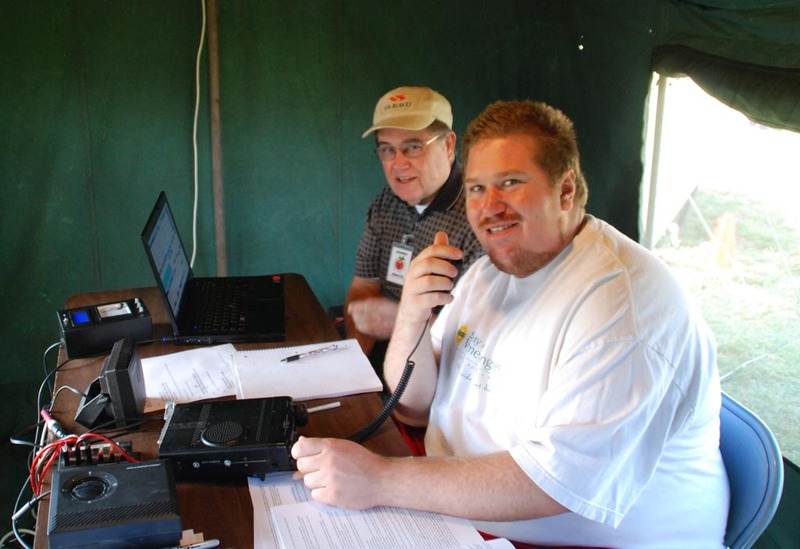 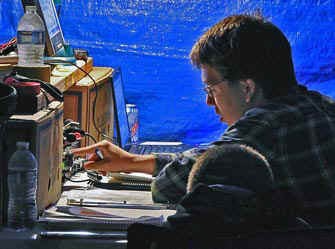 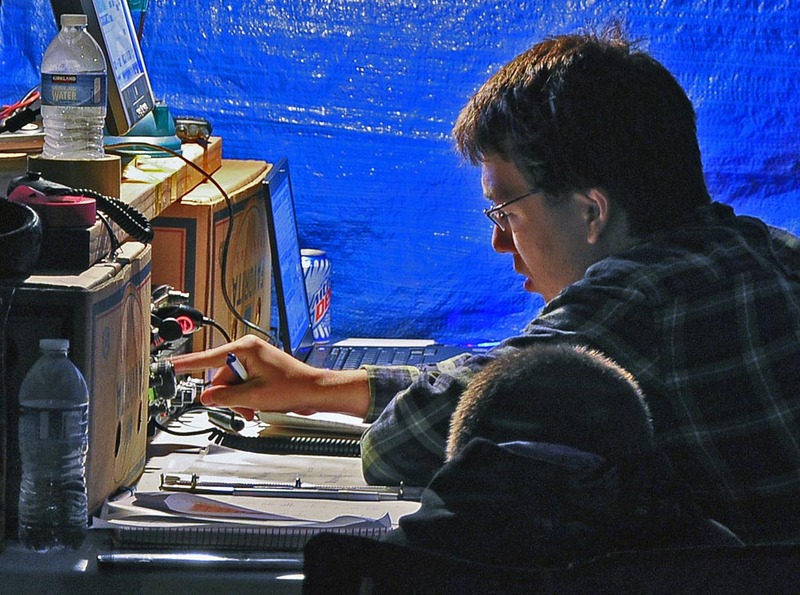 (L-R) Band-capatin Jeff W6UX teams with Tim K6GEP on 15M. 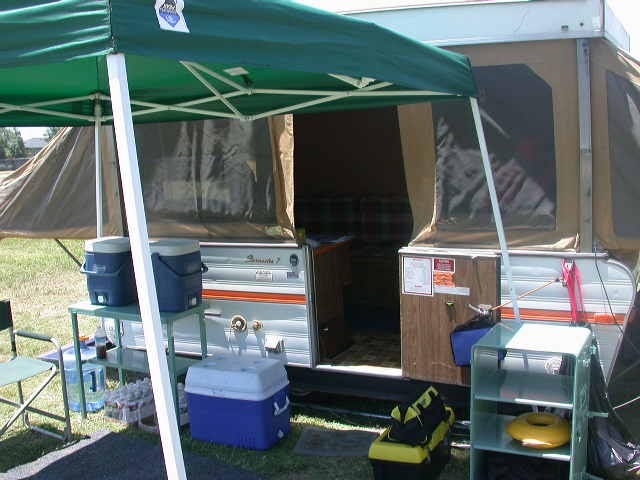 Next ???? (blue shirt) and Jennifer K6JTX (Jeff's wife) look on at the action. 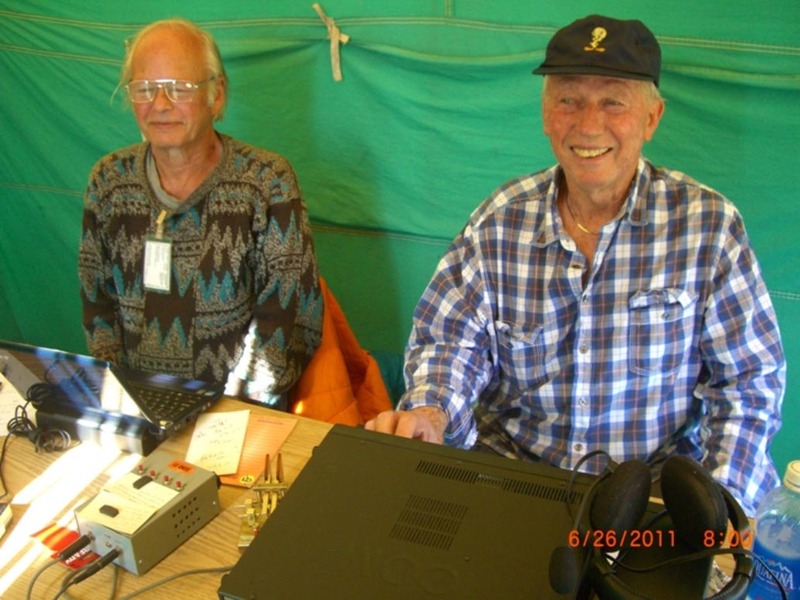 Allen - AB8SA, a friend of Carl and Dee visiting Michigan, takes a turn at operating 15M SSB while Jeff - W6UX logs. 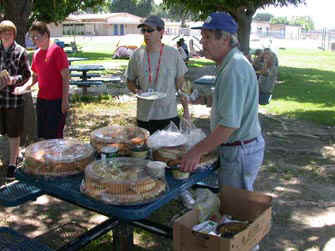 Subway submarine sandwiches were provide to operators for Saturday lunch. Shown are co-FD-chaiman Jeff W6UX and Bob AF6C grabbing some eats during a break in operating along with a few Boy Scouts. ??? learns to log during his first-ever Field day with "el Presidente" Paul W6GMU grinding away on 20M CW. Two CW "pros" (L-R) Larry K6VDP and Larry KR6LO team up to keep the QSOs coming in on 20M CW. 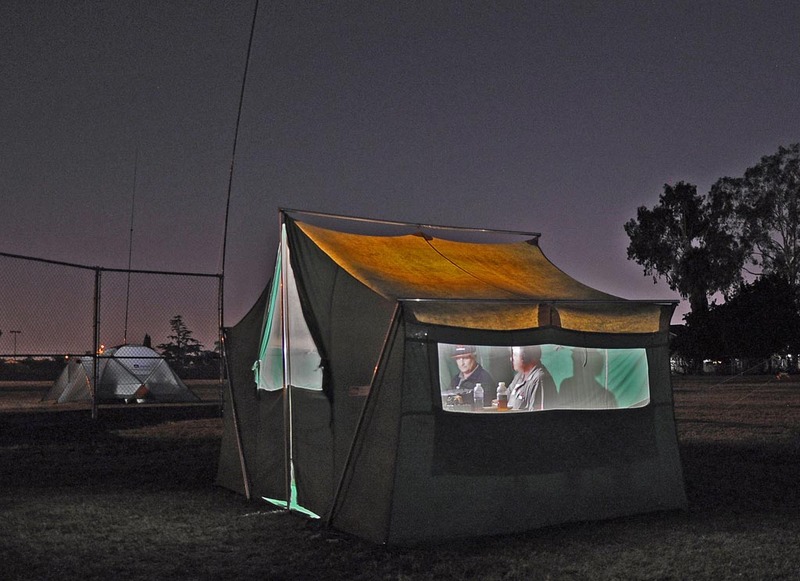 At night, the lights inside the 20M CW station allow the tent to take on a "glow". 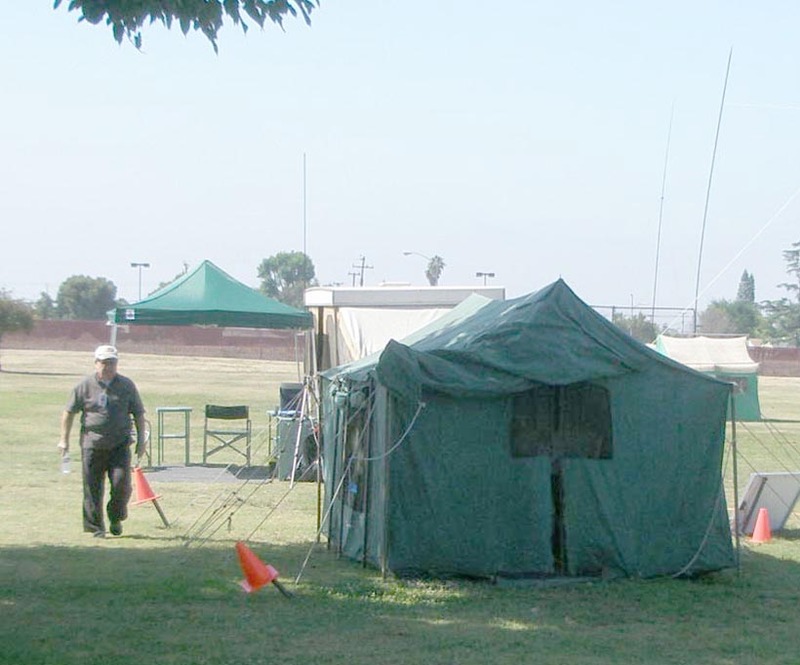 The mast for one-end of the 20M bazooka antenna can just be seen on the left corner of the tent. Mike AJ6E is operating the microphome (during his first-ever field day) on the 20M PHN station, while Bob AF6C handles the logging duties. 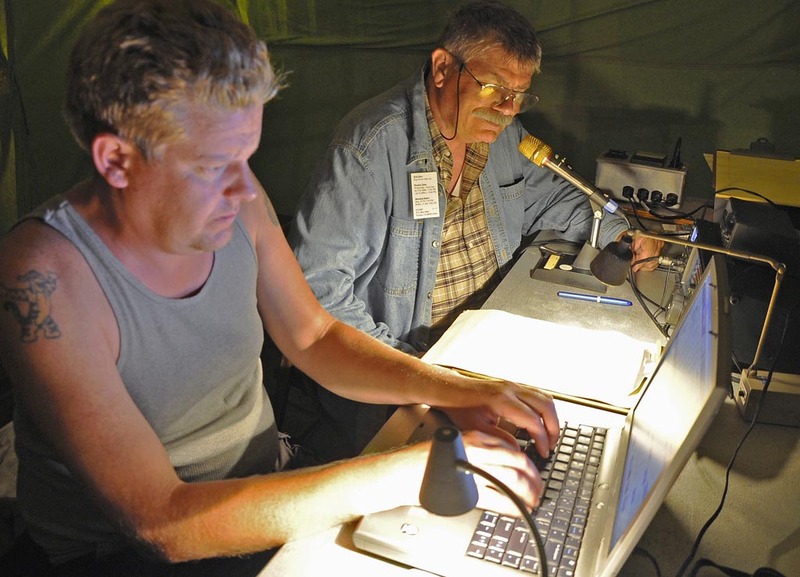 As Saturday night wears on, Ken W6HHC is handling the mike at the 20M PHN station, while Kris W6KJC handles logging. 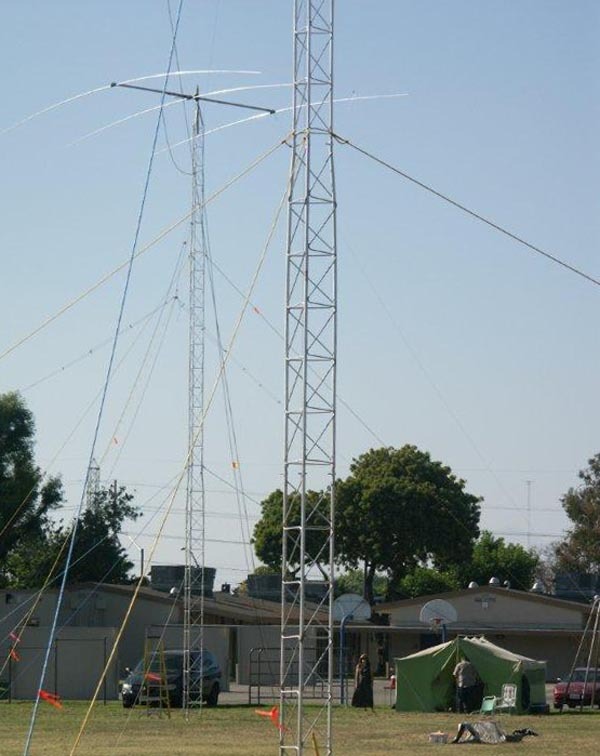 Here is a photo of the 20M PHN 3-ele beam in action on top of the 50-ft aluminum tower. 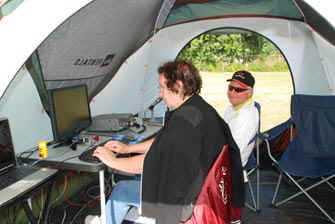 The 20M PHN tent can be see to the right. This is the "open-air" 40M pop-up shelter that provided terrific air flow during the hot afternoon. 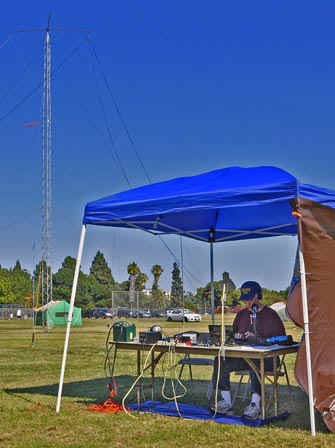 Ron WB6FRV is shown operating "solo" on CW, while the 40M Inverted-Vee beam can be seen on the tower to the left. 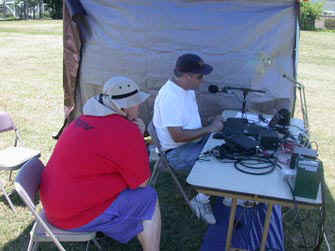 The green tent in the background is for 20M CW. 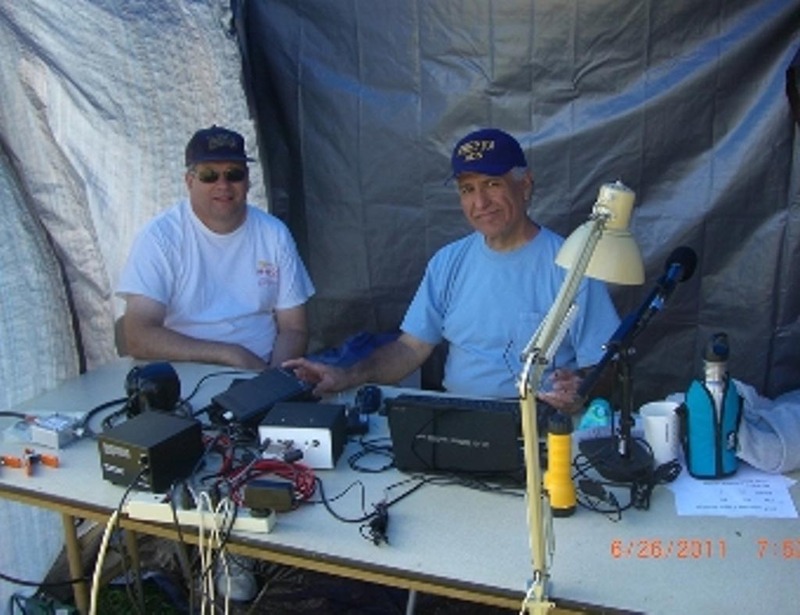 (L-R) band-captain Tim K6GEP and Ron WB6FRV operate the 40M station on both CW and Phone. 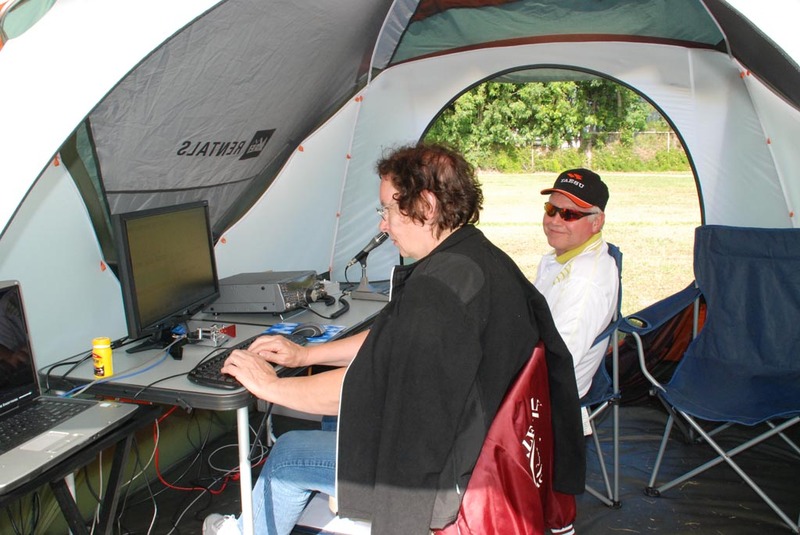 Tim K6GEP operated 40M SSB while Nick KD8IPE watches.